Thanks to William M. Litzenberg. 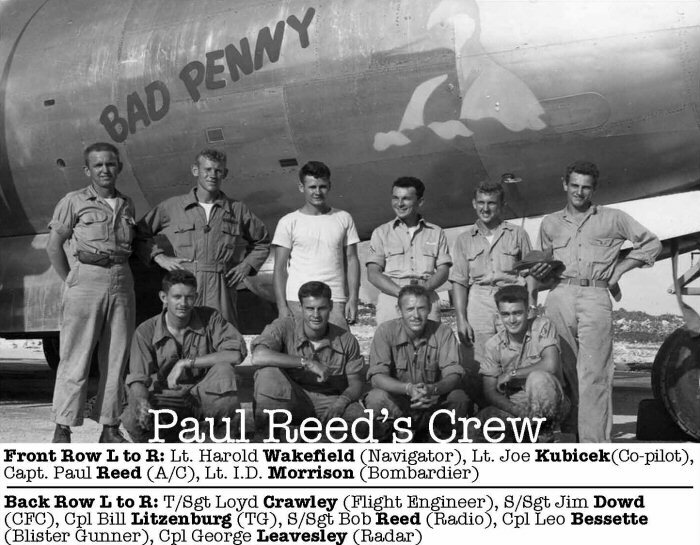 The airplane was assigned to crew #4014 and was named partly after Penny the wife of 1/Lt Paul E. Reed (A/C). In addition to the "bad" Penny" shown in the nose art, the crew was more optimistically thinking of the common saying "A bad penny always comes back". However, this airplane was lost on a night mining mission on March 27. Crew #4014 in front of "Bad Penny". Photo provided by 6BG, all rights reserved. The airplane was originally assigned to Crew #4014, but was lost when flown by Crew #4008. The Crew Chief of this airplane is not known.